Floating row covers are to gardening what Kleenex is to the cold and flu season - a very lightweight, almost insubstantial material, which sometimes can make all the difference in the world. Sometimes plants are just at that threshold when they don’t need total protection from the elements, but they benefit from just a little bit of protection from raw early or late weather. Or, your locale has a flying or jumping insect pest in the area which you want to keep off your plants. In either case, just a little bit of protection gives plants that exrtra little boost they need, to go from struggling to thriving. And happily that protection is available, in the form of floating row covers. What is it, and why is it used? Floating row covers have been around now for a number of years. Reemay and Agribon are two common brand names. They are typically made of a very lightweight spun polyester fabric, available in various weights, which is easily permeable to air, light and moisture. The fabric will not become waterlogged, and it will cast only the slightest shadow on whatever is beneath it. Yet the fabric will slow down or stop hailstones, biting wind and heavy rains. It will provide some protection against frost, down to about 28F depending on the fabric weight. It will not capture and hold sunlight’s heat quite like solid plastic film would, but it will slow the movement of warmed air away from plants during the night. That might be all that’s needed to prevent frost damage. On the other end of the scale, this fabrilc has also been used to block the extreme heat of the sun during mid-day to late-day time periods, particularly for newly transplanted crops that may not have yet had time to develop resistance to sunburn. The white color bounces much of the light away from the plants, but doesn’t actually create much of a shadow, so plants don’t go “hungry” for light. Again, it can be a subtle difference, but sometimes that’s all you want or need. Different crops and different field conditions warrant slightly different installation methods. On sheltered sites where wind is not a problem, growers could get away with holding down the fabric with just a few bricks, stones or soil staples at the corners and along the sides. Most crops don’t need hoops to hold the fabric off the leaves. Crops can be accessed simply by lifting away the stone or brick and reaching underneath. Some growers appreciate the use of hoops simply to give the fabric some form, and allow for easier access to plants. Those growers typically lift the fabric edge and toss the edge over the hoop crest when accessing one side or the other. For sites with more wind, hoops and weights or ground staples along the sides become a necessity. Without the weights or staples, the fabric would blow away. The staples are nice because they can be used for a number of years before wearing out, and they provide a smooth walking surface where rocks or bricks would get in the way of feet and wheels. The number of staples needed would depend upon how windy the site is, and how tall the floating row cover is anticipated to get during the growing season. Without the hoops, sometimes a breeze will flutter the fabric enough to bruise tender leaves. For very prone locations, some growers actually bury the edges of the fabric in either mulch or soil, which dramatically reduces the risk of blowaway. For those growers who are using floating row covers later in the season after substantial plant growth, the fabric can be held in place by taller, stouter hoops of PVC, clips to hold the fabric to the hoops, and soil staples to keep the fabric ends on the ground. Thanks to the material’s light weight, floating row covers can be safely draped across the youngest, most tender transplants without risk of damage to the leaves. It is lightweight enough that the growth of leaves underneath will lift it over time, so that it “grows up” with the crop. It’s easy to work with, available in multiple lengths and widths. It is also easy to cut with scissors yet resists fraying. It’s durable if treated even moderately well, and it is easily rolled up and stored between uses. Abuse in the field, such as being run over with pieces of equipment, or dragged across the ground, will make for ratty edges and may tear the fabric. But if it’s handled well and stored away between uses, it can last for years. The only major disadvantage I’ve ever heard about floating row covers is that, true to the name, they can too easily float away during even mildly breezy conditions. They must be held down and/or anchored with something or they’ll end up in your trees. Or your neighbor’s trees. Another disadvantage for some areas is that any pest you already have in the soil or on the ground with your plants, can actually be trapped underneath once the row cover is applied. Instead of protecting your plants, that entrapment can actually cause a localized increase in damage. So knowing which pests are on hand at any given point in the growing season, and knowing how they move from area to area, is crucial before you can make the most of this row cover’s protection potential. 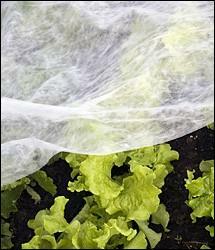 We have used covers on a variety of cool-season crops such as broccoli, kale, chard and lettuces for a few years now. We like that the fabric provides protection against the occasional hail storm, since those storms blow up very quickly with little notice. We also like that it keeps the wind from wracking through the young leaves, because our site is fairly exposed and cold, blustery weather is the norm here in spring. I grew for a number of years without floating row cover and did OK. But when we started to grow for market, and a 10% loss in harvest meant a 10% loss in income, that make a difference. It is one more step in the many steps required to get crops from seed to market, and sometimes it seems a luxury. But one hail storm later, that minimal cost and effort is a small price to pay for protected leaves and thriving crops despite springtime fluctuations. The University of Maryland has a nice 4 page information sheet on floating row covers, available for download in free PDF format. Washington State University has created a 3-page how-to info sheet, in free PDF format, detailing ways to install the fabric so that covers stay put as long as needed. Such detail may seem a tad overblown, but it will make all the difference in the world when strong breezes come along, or when pests are trying to get access to crops. New Mexico State University has published a free PDF summary of floating row covers, including different types, how best to use them throughout the year, installation, and removal. Additional resources and research articles are listed at the end. Oregon State University has made a row cover research project available in PDF format. That project, entitled Response of Vegetables to Floating Row Covers and Plant Protectors In Central Oregon, compared the use of floating row covers with other frost protection measures, for tomatoes, cucumbers and sweet corn in the high, dry, cold desert environment of Central Oregon. These season extenders are popular enough, and valuable enough, that research and development will continue into the future for some time to come. As we become aware of additional new sources of information, we'll share them here. If readers are aware of new reports, methods, materials or other developments, Contact Us with the details and we'll add that information to this page. Floating row cover is widely available, from dedicated commercial growing retailers to hobby gardening catalogs, to big-box home improvement stores and even sometimes in smaller hardware stores. We have provided a wide variety of product links on the right side of this page, from several different manufacturers, all available through Amazon.com. The fabric is generally available in a roll, in various lengths and widths. Many retailers also offer related products alongside the floating row cover, such as lightweight metal hoops and clips intended for larger diameter PVC hoops. Some stores also sell a variety of soil staples, either with the floating row cover and/or with other horticultural fabrics such as weedblock. Reemay and Agribon are two common brands of floating row cover, but they aren't the only brands available. One thing to keep in mind with floating row cover is that you want extra length and width, so that you have enough material at the sides and ends to anchor. You also want to allow for sufficient surplus material to grow up with your crop. One good way to estimate what you’ll need is to determine how tall your crop will be when the row covers will come off, how wide the rows or beds will be at that point, and then use some PVC hoops to bend over those maximum dimensions. Once you have that hoop placement figured out, you can measure the length of the hoop. Tack on 12” extra so that you’ll have 6” on each side for anchoring. In terms of length, you’ll want to keep that hoop dimension in mind because you’ll need at least that much extra at each end to reach down to the ground from the peak of the crop. For instance, if your row covers will be 2’ off the ground by the time they are removed, you’ll want at least 2’ extra on each end so that the fabric drapes down to the ground. Tack on 12” there as well for anchoring material. Happily, the fabric is very easy to cut if you find that your preferred dimensions aren’t available in the locally common roll size. For instance, if your planting beds are 20’ long and rolls are only available on 100’ rolls, that one roll could be easily cut down into 25’ sections sufficient for four rows or beds.